Complement was discovered by Jules Bordet as a heat-labile component of normal plasma that causes the opsonisation and killing of bacteria. The complement system refers to a series of >20 proteins, circulating in the blood and tissue fluids. Most of the proteins are normally inactive, but in response to the recognition of molecular components of microorganisms they become sequentially activated in an enzyme cascade – the activation of one protein enzymatically cleaves and activates the next protein in the cascade. Complement can be activated via three different pathways (Figure 1), which can each cause the activation of C3, cleaving it into a large fragment, C3b, that acts as an opsonin, and a small fragment C3a (anaphylatoxin) that promotes inflammation. Activated C3 can trigger the lytic pathway, which can damage the plasma membranes of cells and some bacteria. C5a, produced by this process, attracts macrophages and neutrophils and also activates mast cells. This pathway involves complement components C1, C2 and C4. The pathway is triggered by antibody-antigen complexes binding to C1, which itself has three subcomponents C1q, C1r and C1s. 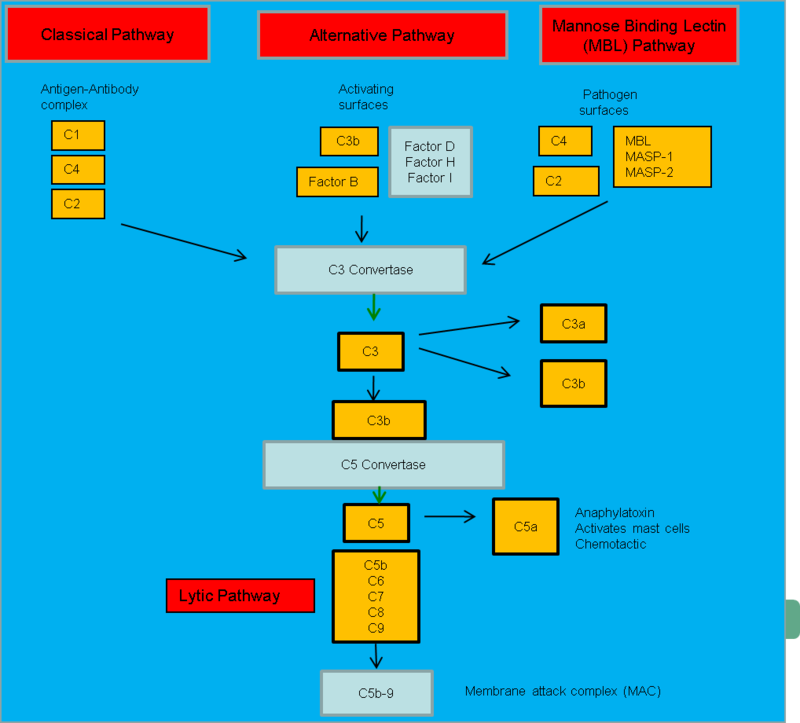 The pathway forms a C3 convertase, C4b2a, which splits C3 into two fragments; the large fragment, C3b, can covalently attach to the surface of microbial pathogens and opsonise them; the small fragment, C3a, activates mast cells, causing the release of vasoactive mediators such as histamine. This pathway involves various factors, B, D, H & I, which interact with each other, and with C3b, to form a C3 convertase, C3bBb, that can activate more C3, hence the pathway is sometimes called ‘the amplification loop’. Activation of the loop is promoted in the presence of bacterial and fungal cell walls, but is inhibited by molecules on the surface of normal mammalian cells. This pathway is activated by the binding of mannose-binding lectin (MBL) to mannose residues on the pathogen surface. This in turn activates the MBL-associated serine proteases, MASP-1 and MASP-2, which activate C4 and C2, to form the C3 convertase, C4b2a. This pathway is initiated by the splitting of C5, and attachment of C5b to a target. C6, C7, C8 and C9 unite with C5b, and this membrane-attack complex (MAC), when inserted into the outer membrane of some bacteria, can contribute to their death by lysis. Red cells which have antibody bound to the cell surface can also activate the classical and lytic pathways, and become susceptible to lysis. The complement system plays a critical role in inflammation and defence against some bacterial infections. Complement may also be activated during reactions against incompatible blood transfusions, and during the damaging immune responses that accompany autoimmune disease. Deficiencies of individual complement components or inhibitors of the system can lead to a variety of diseases (Table 1), which gives some indication of their role in protection against disease.